Dr. Gurpreet Mukker was born in the suburbs of Toronto, Canada, where she spent most of her elementary years. After enduring the merciless winters for years, her family decided it was time for a warmer change. They moved across the country to the agriculture-rich San Joaquin Valley of Central California. Dr. Mukker and her brother grew up working hard on their families almond farm while attending California State University, Fresno. During her undergraduate studies, she worked as a bone, tissue and organ recovery technician. There she came to the realization that she was destined to work in the medical field. However, after many sleepless nights, she soon grasped the importance of balancing family life with work. With this in mind, Dr. Mukker applied to dental school across the nation and was given several opportunities on the east coast the following year. She didn't want to waste time starting her medical studies, so she took the advise of her older brother (who was in his second year of Podiatric Medical School in California) and applied to Podiatry School. That year she was accepted into the California College of Podiatric Medicine. She had every intention of transferring her Podiatric educational units to dental school, but much to her surprise, during the first week of Podiatry School, she realized she had found her true calling. She was so encouraged by the knowledge and expertise of the faculty and her Podiatric Attendings, that she decided to become a Podiatrist, receiving her degree four years later. Dr. Mukker completed a three-year podiatric medicine and surgery residency at the Veteran's Heath-Care System in Palo Alto, California. 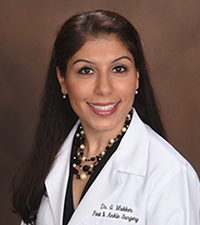 She received extensive and broad training experience through the instruction of multiple specialties including internal and emergency medicine, infectious disease, rheumatology, psychiatry, podiatric, orthopedic, general, plastic, and vascular surgeons. Dr. Mukker immersed herself into the training and lecturing of podiatric and medical students through clinical and hospital-based rotations. During her second year of residency, she was given an opportunity to be a volunteer surgeon for Mission Peace, a medical mission in Southern Vietnam, which provides Surgical services to correct deformities caused by neurological diseases and Agent Orange. This allowed children and adults the opportunities to have a more functional life and removed the stigma of growing up with a deformity. Dr. Mukker is trained in assessing and treating all disorders of the forefoot and rearfoot, surgically and non-surgically in both adults and children. Her professional memberships include the American College of Foot and Ankle Surgeons and the American Podiatric Medical Association. In her spare time, Dr. Mukker enjoys golfing, snowboarding, painting and cooking. ©Copyright 2017 Conroe Foot Specialists | Huntsville Podiatry Associates | Woodlands Foot Specialists. All rights reserved.